One of my GFs recently said, "I have begun to want to wear more jewelery", and asked what I thought would be an essential first piece, after her wedding ring. I suggested a beautifully-made chain necklace, in a 16 to 18-inch length. You can wear it alone, or add a pendant. A chain fills in a neckline, updates classic pearls, or polishes a simple tee. Many chains are generic; hold out for something perfect. The right one will have some weight and detail, unlike the thin gold threads offered as high school graduation gifts. (Melt them down or give to a young niece.) Let's avoid the Mr. T look, but still show some attitude! The price: hundreds for for silver, up to thousands for for gold. Plate will do for occasional wear, but for a chain that becomes part of your body, buy silver, gold or (steep intake of breath) platinum. You'll feel the difference every time you put it on. Beautifully-wrought silver is wearable and elegant. Look for just enough detail to take it from plain to pleasing. 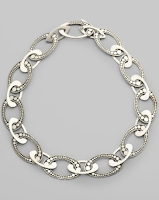 Hi, Bali: John Hardy Silver Oval Link Necklace, Short (18"), $995. Oval links of dotted sterling silver alternate with smooth links; the 1 1/2 by 1" link proportion lends presence without overpowering. The Balinese dot technique gives it an ethnic vibe. Great for everyday. Saks Fifth Avenue carry this, among other chains. They will ship most goods internationally to 34 countries if the value is $2500 or less. 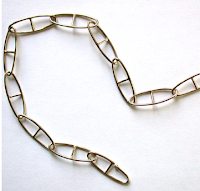 Good DNA: I'm also liking this reproduction of a William Spratling design, a silver "DNA" necklace. The ovals and barbells (shown in detail at left) twist in a helix around one another for more texture than classic links. It's from eBay seller cotoliro, from whom I have happily bought. The chain is 20", perfect if you who need or prefer a bit more length, and at $240 for 170 grams of 925 silver, reasonable. Toujours Chic: The 17" chaine d'ancre, to wear every day and bestow one day, $1, 125 from Hermès web site or in boutiques. There are many offerings in the gold chain universe; I'm not showing those you might think of first (David Yurman, Tiffany, Van Cleef clovers); for my money there are too many knock-offs. If you're buying gold, choose at least 18k so your chain looks sensuous and develops that glowing patina. Versatile minimalist: Far left, This Temple St. Clair chain has more interest that a boring box link, and layers well with other necklaces or carries a pendant. Temple St. Clair 18k Ball Chain, 16", $450 from Saks. 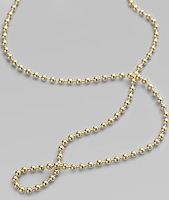 Luxury: From Bergdorf Goodman, Yossi Harari 24k gold Marina Wave Necklace, $5,075. The grace and fluidity of this handcrafted piece, enhanced by the richness of highest-karat gold. 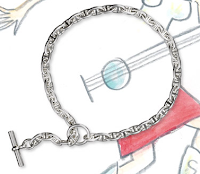 If you can find a handmade chain, the cha racter imparted by the artist will be be evident. Watching my pennies: Nancy Caten's 16" gold-filled chain with hammered rings offers elegance for a modest outlay, $175 from Fragments. A good buy if you're trying out how much you'd wear a chain. 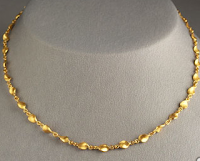 Womanly gold: Ray Griffiths' 18k yellow gold cloverleaf necklace is so distinctive that I wanted to show it in detail. Sumptuous yet airy, this is a grown-up chain, priced ($2, 600) to match. Past 50, I think we should consider this level, and I'd save for it over a number of bitsy pieces. Hip Parisienne: Ann Gerard is one of my favourite jewelers in Paris. 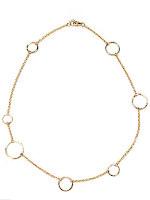 Here's her Collier "Oval", in green gold, 55cm (21 in. ), €1280. As Ann says, "Put it on and you're dressed." The paperclip chain can be worn as a necklace or lariat. Chain with jewels: My friend Joyce friend says, "If there are no diamonds on it, it isn't jewelry." This one's for you, Joyce, except it's ruby, because you already have your Diamonds by the Yard chain. 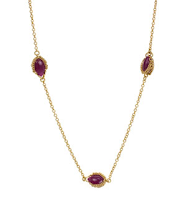 The 18" Anthony Nak Ruby Briolette Necklace adds rubies shelled in gold, stationed at 2" intervals. This is another piece that looks great worn alone or layered with favorite necklaces. $1,200 from Twist Online. My 18 yo daughter bought me some chains from Forever 21 (so cheap beyond cheap) and even these elicit compliments. Lovely post and wise advice for your friend. I'm in the market for a good basic chain--somewhere between the skinny thread and Mr. T look. My fave is the one from Ann Gerard. Thanks. Amazing examples. I do agree on having one lovely piece. I don't carry it anymore. I just bought myself a silver chain that has an artisan look I love. (it's by a Vancouver designer/artisan, Karyn Chopik). I've been getting so much use from it, with or without the metal pendant I bought along with. Have to say that I so much appreciate the education I'm getting in jewelry (and how to wear it well) from your site, Duchesse! Thank you for sharing. I believe silver is great for the young ones and whitegold/platinum to be saved for the women of certain age. Gold for everyone.. The paperclip chain looks like fun. Those are some seriously gorgeous pieces. Gold for me, please...am especially entranced with that Ann Gerard! Anjela: If you send a photo, I will post, I'm probably not the only one interested! ma: Congratulations, sounds so "you"- Would love to see a photo of that, too! But the paperclip chain is soooooooooooooo lovely! (BIG sigh...) Sadly not in reach for my budget, but it is nice to know it exists in the world. A wise investment for whomever does buy it. I would wear that every dang day. It's so nice to see designers getting clever with gold again. For a long time the only interesting pieces (just metal, no stones) were to be found in silver.